E3Live’s First Ever Video Contest! $1500 in Cash Prizes and More! Get EXCITED. We are running a video contest! Our loyal fans have great imaginations and we are eager to see what entries we get. Special prizes will be awarded! Finalists will receive 6 bottles (16oz) of E3Live or BrainON! All you have to do is submit a video up to 3 minutes in length showcasing E3Live, an E3Live product currently offered on our website, or the E3Live brand in some creative way. It could be something funny, a recipe, a parody, a song, a skit, something endearing, something daring, something artistic, anything fun & creative that does not harm anyone and is not an illegal activity. 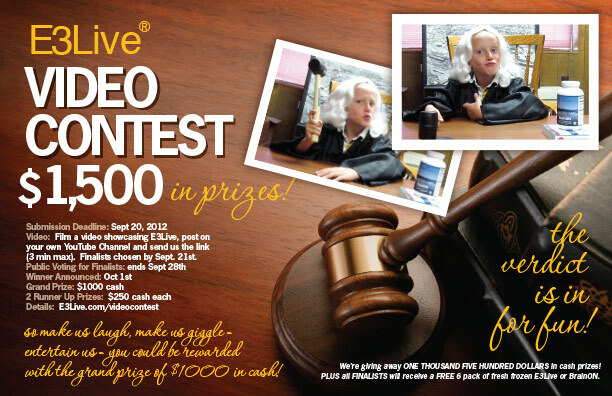 So, make us laugh, make us giggle — entertain us — You could be rewarded with the grand prize of $1000 in CASH! We are getting so many fun comments for our video comment contest – add yours today for a chance to win! Hurry, deadline is Aug 10th! E3Live Harvest With The Incredible Green Algae Man! Best Comment for this video (by August 10th) receives free E3 goodies! Click link below for details. To enter the contest – be sure to watch the video on our YouTube channel at the link below (and enter a comment on YouTube for it to be part of the contest), good luck and have fun!